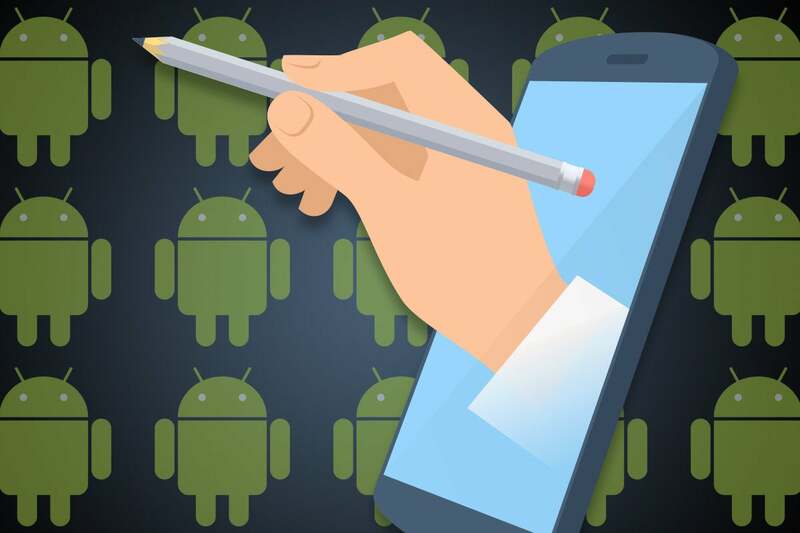 Taking notes is serious business, and having the right note-taking app for your Android device can make a world of difference in your ability to stay organized. That's because a good note-taking app doesn't just help you take notes; it also makes it easy to find what you've saved later, regardless of where you are or what type of device you're using at that point. But figuring out which note-taking app makes the most sense for you isn't always easy. The Google Play Store has an endless array of similar-seeming options, and what's ideal for one person may not be optimal for another. I've spent a lot of time exploring the most prominent contenders for note-taking on Android, and I've identified the apps that rise to the top in three core categories: a "best for most people" tier, with a happy-medium balance of features and usability; a "best fully featured" division, with a focus on apps that provide a more robust set of functions for those who need it; and a "best no-frills" class that offers a recommendation for those seeking the utmost in simplicity. 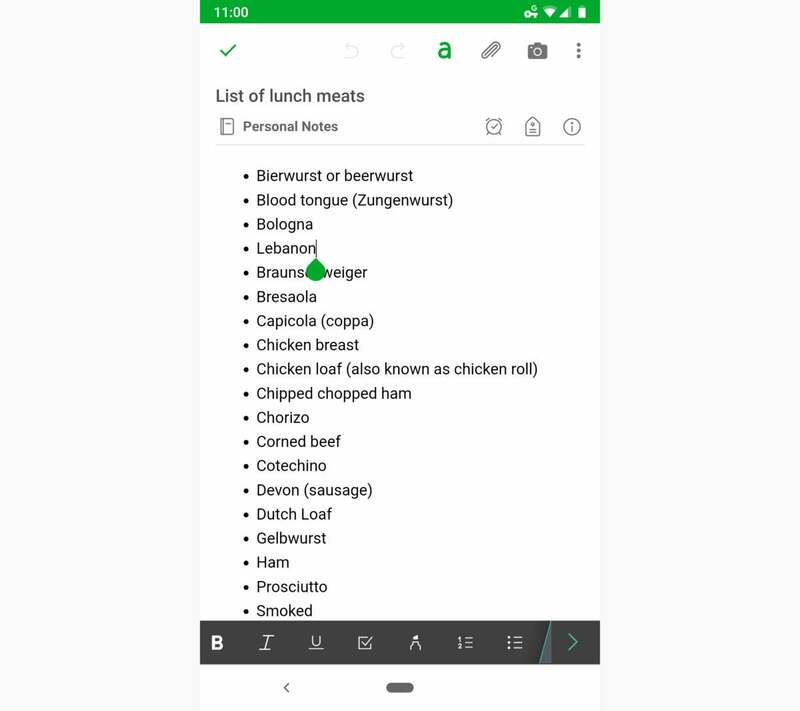 Here, section by section, are the best note-taking apps for Android. 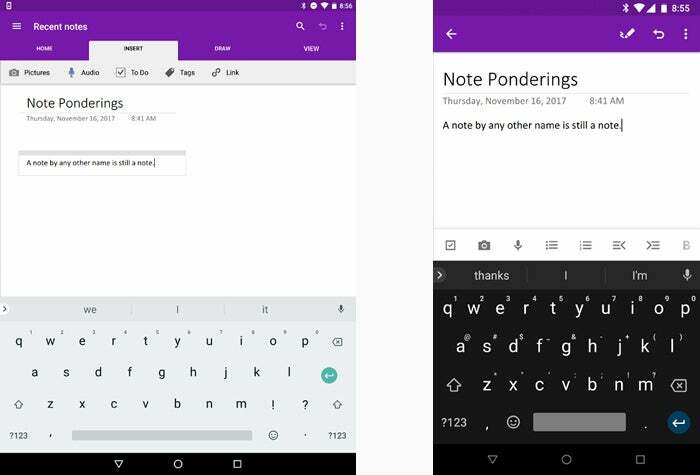 Google's note-taking app has come a long way since its awkward 2013 debut. These days, Keep is a well-rounded yet exceptionally intuitive offering with many compelling elements, particularly for anyone invested in the Google ecosystem (as many Android users tend to be). Simplicity is a key part of Keep's appeal — because the reality is that most folks don't need a complex, multilayered note-taking tool with oodles of superfluous features. Most of us just want a simple and effective place to jot down thoughts, ideas, and lists in a way that'll make them effortless to access at a moment's notice. And that's precisely where Keep excels: Open the app and tap the "Take a note" bar at its bottom — or set up the one-touch note-taking widget on your home screen (accessible by long-pressing any blank area of your home screen and selecting the "Widgets" option that appears) — and you're off to the races. You can type using your onscreen keyboard, write using your finger or a stylus, speak (and then save both an audio file and a plain-text transcription of your ramblings), or snap a photo of a document or anything else and let Google pull the text out of the picture for you. Keep's main screen is a delightfully manageable collection of your most recent notes. Changing a note's position is as easy as dragging and dropping it or tapping a pin icon to ensure it stays at the top. You can color-code notes, if you want, and give them labels for subject-specific browsing. And, of course, you can use the search box at the top to quickly find notes by keywords — both those included in your own text and those visible in any attached documents or images. Google Keep is easy to manage — and easy on the eyes. Everything within Keep syncs automatically, without any configuration or manual action required. And you can get to your notes from pretty much anywhere, since Google provides near-identical interfaces for Keep in a Chrome app, an iOS app, and on the Keep website. 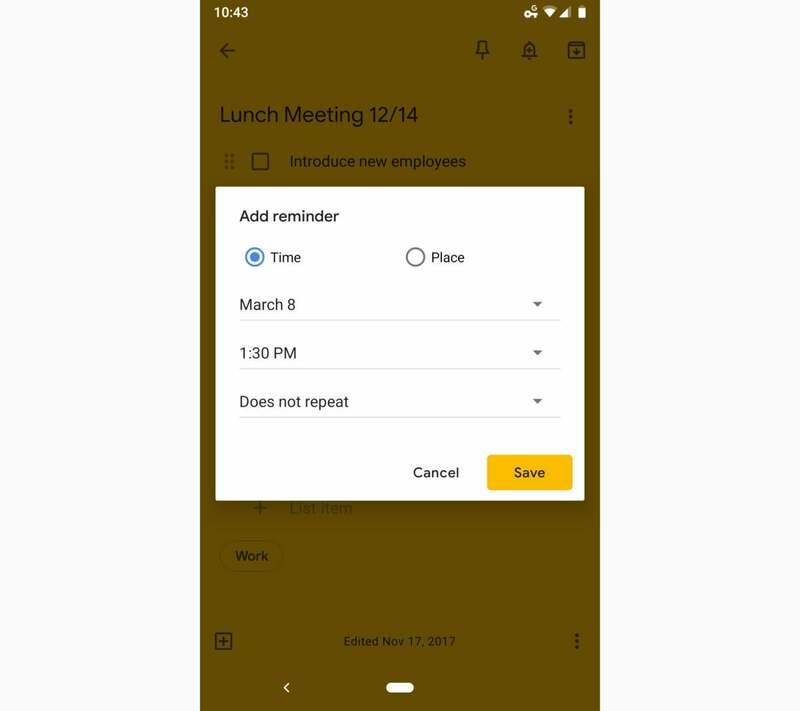 As far as ecosystem, Keep integrates intelligently with Google's cross-platform reminder system — which means you can create a reminder on any device and then have it pop up on your phone at a specific date and time or even when you venture into a particular geographical location. Keep's time- and location-based reminders make sure you never forget an important note. And Keep works hand in hand with Google Docs as well: With a couple quick taps, you can send any note from Keep to Docs for more involved editing. The Docs website, meanwhile, lets you pull up your notes in its sidebar and send content in either direction. Factor in Keep's multiuser collaboration feature, which lets you share notes with others so they can edit them, and this simple-seeming app is actually chock-full of functionality. It may not have all the bells and whistles other products offer, but as long as it has everything you actually need in a note-taking app, its lack of clutter and complication can be a critical productivity feature. For some people, a note-taking app is more than just a searchable virtual notepad; it's a finely organized system with mountains of features and intricate options. If you're someone who needs a little extra oomph in your note-taking hub, Evernote is the app for you. Evernote does most everything Keep can do and then some. In addition to the above-mentioned basics, the app features a notebook-based system for categorizing your memos. It lets you create shareable links so you can publish notes on the web for anyone to see, whether they use Evernote themselves or not. And it makes it easy to add both emails and web pages into your notebooks via a unique address for forwarding messages and a desktop-based browser extension for capturing content. Evernote is filled with features to help you collect and organize all sorts of information. In addition to providing an account-wide search function — which, like Keep's, can find text within images and handwritten notes — Evernote allows you to search within an individual note as you're editing it. And it has a bevy of advanced text-formatting tools for making your notes look any way your structure-loving heart desires. 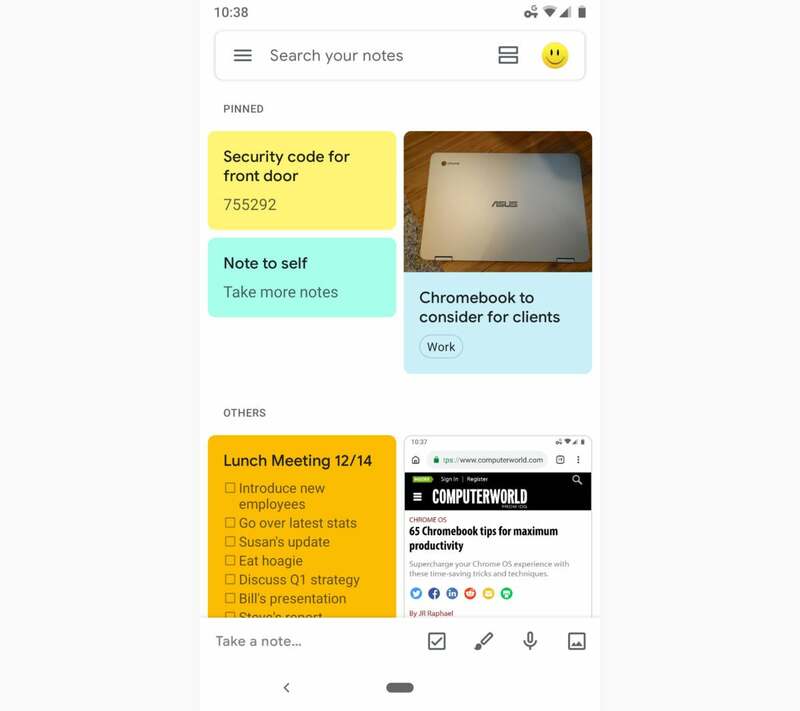 Evernote also allows you to view and revert to previous versions of notes, and it offers the ability to add an app-specific passcode or fingerprint for extra security. Evernote has an impressive selection of tools for editing and formatting your notes. All of this, however, comes with a few noteworthy caveats. First, Evernote has become a bit bloated over the years. It lacks Keep's immediate intuitiveness and is bogged down with loads of clutter most people won't use, like a built-in "work chat" function (in addition to the standard sharing and collaboration function) and a system for showing you related notes, contacts, and news articles as you write. The app even feels slower to use, which isn't something you run into often with modern mobile technology. Second, Evernote lacks the rich ecosystem integration an app like Keep can offer. Sure, it lets you collaborate on notes with other Evernote users — but whereas almost everyone has a Google account and thus can hop into a Keep note and start editing at a moment's notice, most people don't have an Evernote account and may or may not want to create one for your benefit. (Of course, this concern doesn't apply if your company has an Evernote business plan and you want to collaborate with co-workers.) Similarly, Evernote has its own internal reminders system, but that's a far cry from the universal nature of Google's equivalent. And third, it's gonna cost you. 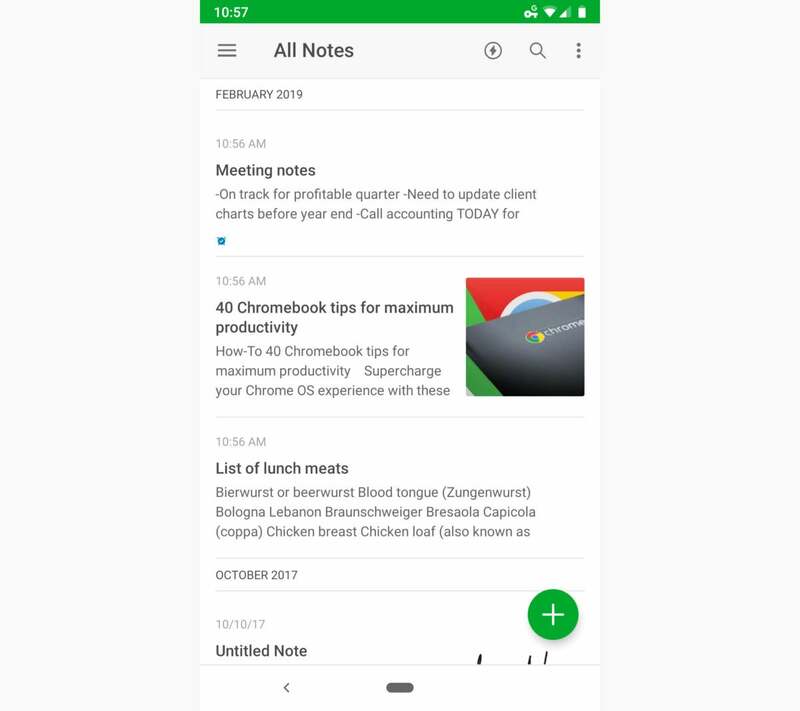 Evernote's free level of service is fairly limiting, with no offline access from your Android device, a limit of two devices total for syncing, and a cap of 60MB per month for note-related uploads. The free plan lacks many of the more advanced features mentioned above, too, including the ability to search within attachments, view previous versions of notes, and forward emails for inclusion. To get the full works — and to avoid being pestered with upsells almost everywhere you look — you'll have to pay $8 a month for a "Premium" subscription or $15 per user per month for a business-level subscription. 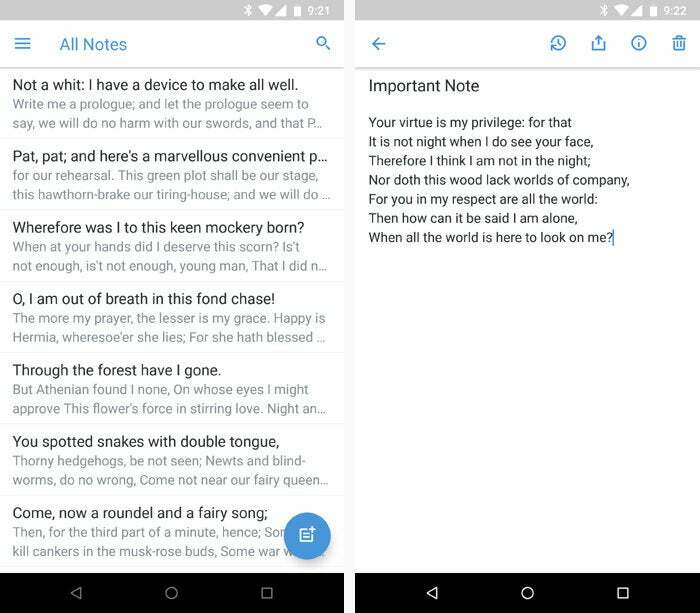 If a fully-featured Android note-taking experience is what you're after, though, it's arguably a price worth paying. OneNote has evolved into a powerful and versatile note-management solution, with a feature set that's almost on par with Evernote's and the benefit of integration with Microsoft's vast Office ecosystem. Plus, it's free. In fact, OneNote almost earned the honor of besting Evernote and claiming the spot as the top pick in this section. So why didn't it? Well, for one, the app is missing any sort of system for setting reminders, which is something most note-taking aficionados will want to have. But beyond that, on Android, Microsoft inexplicably limits some of OneNote's core features — including organizational basics, like full text formatting tools and note-tagging access — to tablets. That means when using the app from an Android phone, you get an oddly incomplete-feeling second-class experience. OneNote's phone experience pales in comparison to what the app offers on a tablet. This sort of mentality harkens back to Microsoft's original approach to Android app development. More recently, the company has come around to a more contemporary view of creating a single consistent user experience that's equal across all devices. But with OneNote, that pesky old mindset is vexingly still on display — and that results in a subpar user experience for the most commonly carried type of Android device. Because of that, OneNote for Android is impossible to recommend wholeheartedly. If you're invested in Microsoft's ecosystem, however — and/or want a less costly and bloated but still fairly full-featured Evernote alternative — OneNote could be worth considering. Just make sure you're OK with the compromises it requires. The last app in our list is for anyone who wants a clean and minimalist space to take notes without any extras or unnecessary distractions. Simplenote lives up to its name and offers a refreshingly pared-down environment for writing and thought collection. The app, made by Automattic, the same company behind WordPress, presents you with a sparse list of text-based notes and a blank page for editing them — no image or audio attaching, no formatting, no fuss whatsoever. From viewing notes to editing, Simplenote is as simple as it gets. Simplenote does have a handful of features beyond the absolute basics, including a rudimentary system for tagging notes; an option for publishing notes to shareable URLs; and a slider for viewing a note's history and restoring old versions. And the app keeps your data synced and accessible across multiple platforms and devices, with versions available for Windows, macOS, iOS, Linux, and the web. Other than that, though, there's really not much to say about Simplenote — and that, notably, is kinda the point. This story was originally published in December 2017 and updated in February 2019.